In the last few days, I took profits in some of my gold stocks, and used the proceeds to increase my holdings of quality silver stocks. This shift in my portfolio puts me heavily overweight silver stocks. The reason I went overweight silver stocks is simple – the quality silver stocks I own are the stars of my portfolio. As good as the gains have been in my gold stocks, the gains in my silver stocks have been even better. What’s more, I think it is likely that the unusually strong action in my silver stock portfolio may be an early sign of things to come – specifically, that silver and silver stocks may be on the cusp of a big move up. If silver does move up strongly, the silver stocks are likely to do even better than the metal. Why do I think this may the case? Because the action in the quality silver stocks I own are providing the kinds of signals that often precede such moves. As a trader of precious metals stocks, one of the key signals I am always evaluating is the relative strength of the precious metals shares in comparison to the underlying metals (i.e., gold or silver). Specifically, I look for signs that gold and silver stocks are either outperforming or underperforming the respective underlying metals (gold/silver). In reverse, if silver (or gold) is inching up slowly, or even a little down or flat over a span of time, but the silver (or gold) mining shares are powering up, it is often a pretty reliable harbinger that silver (or gold) is ready to make a move higher. Although many silver stocks are well below the highs they made when silver was soaring earlier in the year — what I call the elite silver stocks are telling a different story. The action in these stocks, which tend to be highly sensitive to prices changes in the metal, appear to be sniffing out an imminent rise in silver, possibly to new all-time highs. With silver still well below the highs it made earlier in the year, a number of elite silver stocks are showing profound strength and are close to recapturing their old highs. 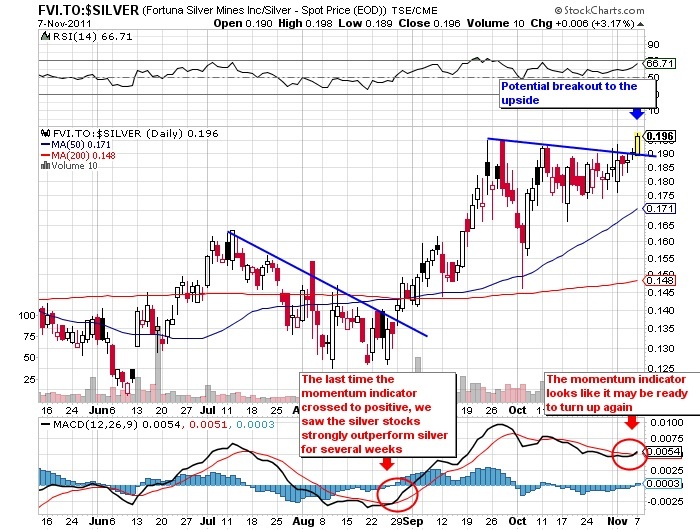 As an example, let’s look in detail at one of the quality silver stocks I own, Fortuna Silver, and the story its recent action may be signaling. As you can see in the price chart above, with silver well below its all-time highs, Fortuna is close to recapturing its all-time high. A few other elite silver stocks are in similar situations. Just looking at Fortuna’s price chart alone, one may come to the conclusion that Fortuna Silver may be close to topping out, as it nears it’s resistance zone of previous highs. In the past, when Fortuna revisited its old highs in this area, it experienced steep corrections. If we take a look at a relative strength ratio chart of Fortuna Silver versus silver the metal (see the chart below), we see a very interesting picture! (Relative strength is determined price of the stock divided by the price of the metal, in this case, Fortuna divided by the price of silver. If the chart line is rising, Fortuna is performing stronger than silver, and vice versa). The chart of relative strength above shows we just may on the cusp of a significant multi-week up-move in Fortuna Silver, and by extension silver and silver stocks. Trading is always about assessing probabilities. There are never any guarantees. On balance, I think the probabilities look good for a potential multi-week rally in silver stocks, and I am positioned accordingly. Trader Dave is a full-time investor and trader of precious metals stocks. Trader Dave writes about his insights on gold and silver mining shares on his blog, Epiphanies on Gold and Silver.